The Frank Lloyd Wright Home and Studio was closed for the day by the time we arrived in Oak Park, Illinois. We bought a map in the gift shop and walked around the corner. 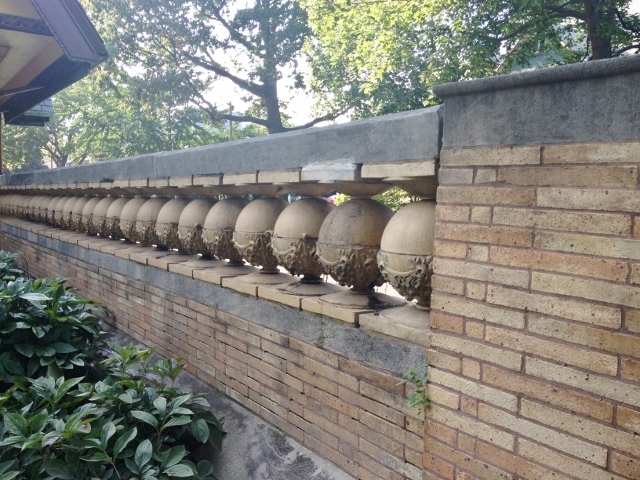 On Forest Avenue, most of the homes were not designed by Frank Lloyd Wright. The yards are not wide, so it’s one lovely house after another, mostly Victorian and conventional, as you see above. And then, bang. 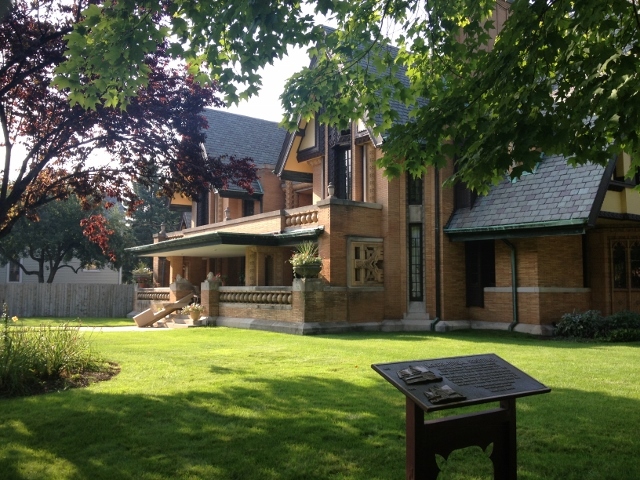 The 1902 Arthur Heurtley House, designed by Frank Lloyd Wright. This is Prairie Style, horizontal as Great Plains. Wright wanted to create an American style for homes. This home has leaded windows, for which Wright is known. 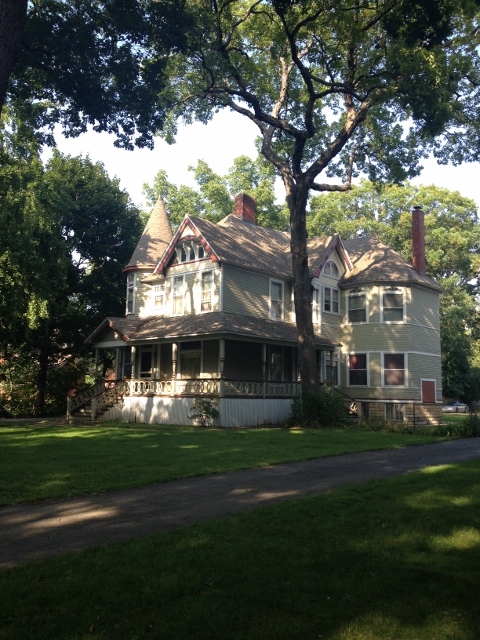 Across the street is the Moore-Dugal Residence, built by Wright in 1895. It’s a Tudor with some twists. 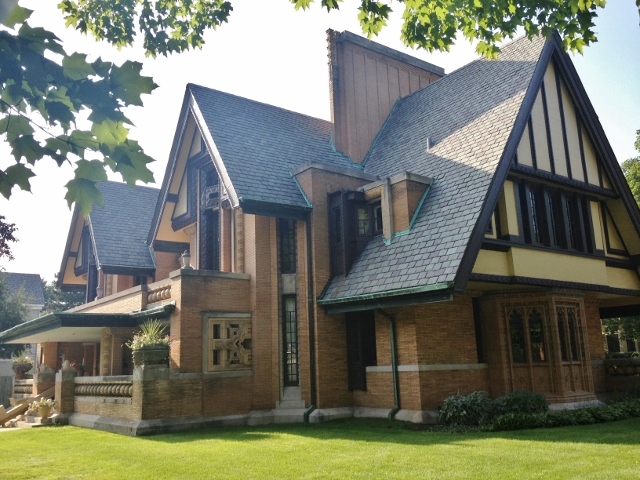 Wright said, “A porch on a half-timber English Tudor. That never happened before.” I like the balls under the porch railing, and elsewhere, like the fence, where I got a close look at their ornamentation. This house went through a fire in the 1920s, and Wright, who had moved on from Oak Park, returned to redesign and rebuild the ruined upper half. The chimney had been conventional before, and he replaced it with a blade-shaped one. Too bad Wright’s studio and home were closed, but if I had got there on time, maybe I would have skipped the neighborhood tour, which I enjoyed very much. I did get to see his studio and home from the outside. 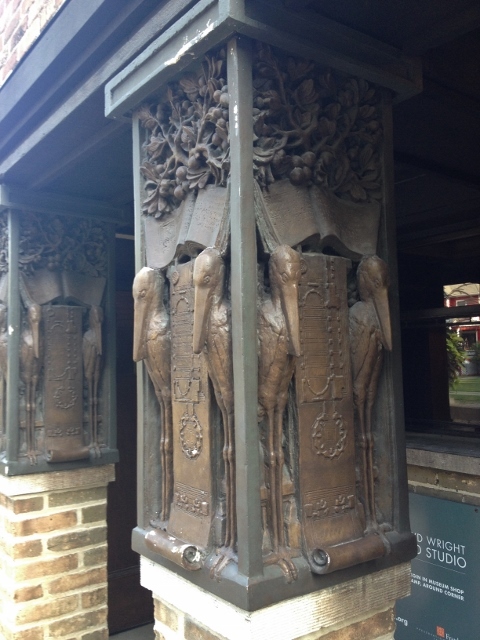 The pillars have birds on them. There’s a lovely plaque with his name in stone, and above it, one of two sculpted crouched figures. Would I have noticed this, up high, if I had toured the interior? I don’t know, but I do know I will try to go back. If you travel to Phoenix, take a tour of Taliesin West which was the winter location for Mr. Wright. I have been there three times with guests from out of town and I learn new things with each visit. It is interesting how “failed” plans can lead to fabulous discoveries! You may enjoy taking a look at this article which takes a critical look at one of Wright’s later designs – The Gammage auditorium on the ASU campus in Tempe, Arizona. It is one of the best venues in the state but the architectural design definitely gets people talking the first time they see it. Google images can give you the full effect! Thanks, Colette! You’re right, it’s critical of his design, exterior but not interior. I had never heard of this building. You suggested Google images (that’s a link). 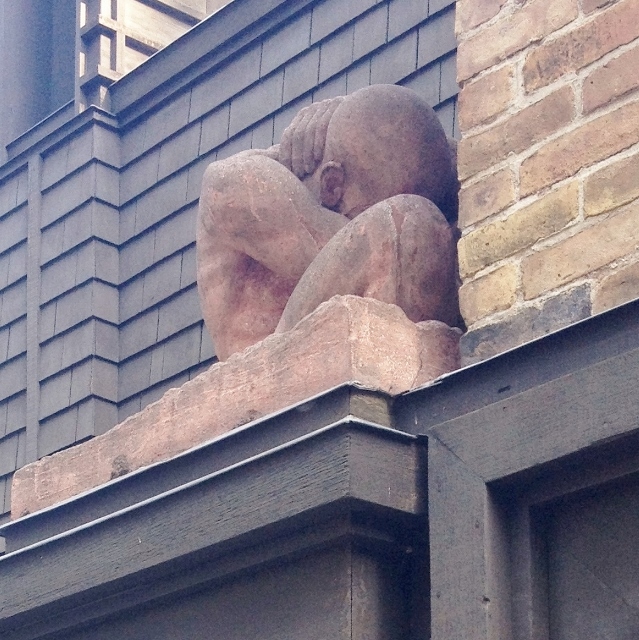 I’ve been to the Lloyd Wright home in Oak Park, and it was lovely. But I’d say your timing wasn’t as bad as you might think. The neighborhood tour might just beat it, per your photos.